before my eyes, when I imagined the Stimmung that can be experienced at the entrance to a church...; Stimmungen des Vorfrühlings; (...) a well in the eld with a trough, with two ravens sitting on it. General Stimmung is that of eve of spring, melting snow can be seen everywhere; ... what is still left to do by the end of the month? After the outbreak of WWI he voluntarily joined the army as a front-line painter and created a wide range of artistically difficult and riveting works on the meaning and the value of human life. Mednyánszky was attracted to tragedies and natural disasters his entire life. On the one hand he was fascinated by the grandeur and power of the elements; on the other hand he had a deep sympathy with the suffering. Instead of representing victories and bloody battles, he focused on the depiction of consequences of war, grief and pain behind the battle lines and ordinary human troubles. His paintings show desperate faces of the helpless and disfigured, the resting soldiers, dead bodies blending in with nature where their sacrifice seems to be totally useless, or long lines of prisoners of war and carts. This period also saw the culmination of his figural painting, with the outcasts and vagrants turning into a broad mass of helpless and desperate people. He was born on 23 April 1852 in the village of Beckov as Ladislaus Josephus Balthazar Eustachius von Mednyánszky. Until 1863 he lived in Beckov, later in a family mansion in Strážky. In 1864–1865 he took private lessons from an Austrian painter Thomas Ender, who later provided him with plaster models and other tools. Between 1872 and 1874 he studied at the Academy of Fine Arts in Munich (Prof. Alexander Strähuber, Prof. Otto Seitz), and between 1874 and 1875 at the École des Beaux-Arts in Paris (Prof. Isidore Pils). Yet, he soon realized he did not want to continue in academic studies. 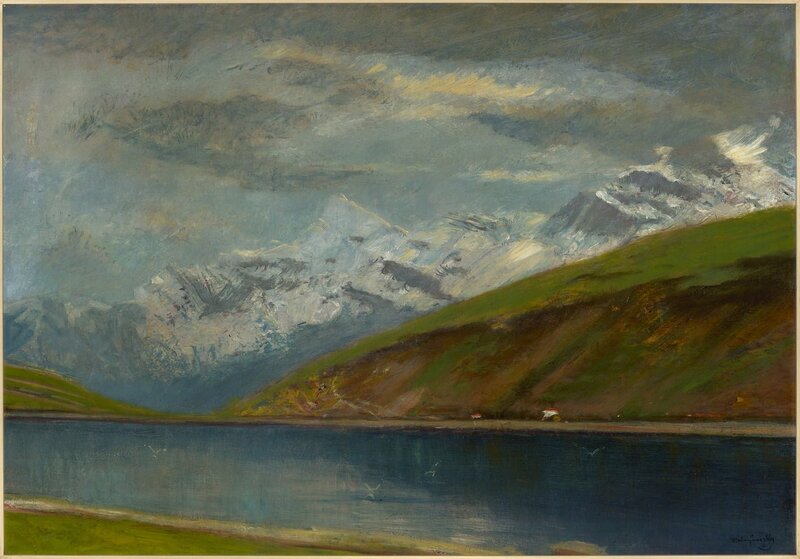 In 1875 he visited Barbizon for the first time, and befriended László Paál, Karl Bodmer, Odilon Redon and other artists. Between 1875 and 1876 he divided his time between Paris and Barbizon, and displayed his works at the Paris Salon. In the spring of 1877 he visited Szolnok, where he met August Pettenkofen and Tina Blau. He made study trips to Italy (1877–1878) and France (1889–1892, 1896–1897). He regularly rented a studio in Budapest, Vienna and during his stays also in Paris. He travelled extensively (Hungary, Austria and Italy), but until the end of the nineteenth century he regularly returned to Beckov and Strážky. Mednyánszky died on 17 April 1919 in Vienna.